When it comes to salads I only like them made fresh. Having a prepacked salad for lunch doesn’t work for me. I’m always trying to find different ways to get more veggies into my lunches. I want something that carries well, can be eaten at room temperature, and will last at least a week in the fridge – so I can make a batch at the beginning of the week. This salad was a success. The broccoli is a study vegetable so it’s great for a packed lunch and carries well. It’s also filling. The kimchi makes it spicy and its juices serve as a dressing for the salad. It’s something different, and something good. In a skillet on medium heat toast the sesame seeds. About 2 minutes. Remove and set aside. Add the grapeseed oil to the pan. Add the broccoli florets and ginger. Sprinkle with salt and pepper. Saute for 3 minutes until bright green and slightly charred. 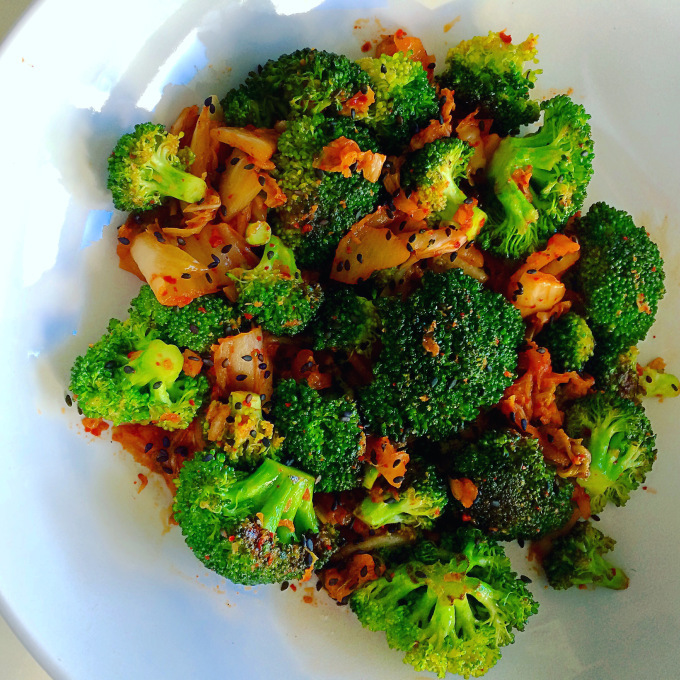 Reduce heat to low; add kimchi and cook until warmed through and mixed well with the broccoli, about 2 minutes. Take off heat and toss with toasted sesame seeds, sprinkle with flaky sea salt, and drizzle with sesame oil. Want to make it a meal? Make a rice bowl. I put one cup of cooked rice in a bowl, cover with the broccoli kimchi salad, and top with a fried egg. Quick, easy, and delicious.